Realtor, Coldwell Banker Fahey Properties, Inc.
Suzan is a lifelong coast-side resident and Realtor for over 30 years. In 2013 she was elected President of the San Mateo County Association of REALTORS® Foundation (SAMCAR) and is a consistent SAMCAR award winner. Suzan has been on Caminar's board since September 2013. Olana’s commitment to the social sector began at a young age, when she realized that the birth lottery determined a person’s access to basic human rights: shelter, food, healthcare, and education. Olana spent over 15 years in the technology sector, working with Netscape, America Online, and Google. She moved into the social enterprise sector by joining Kiva, the pioneer of online microfinance, as Chief Operating Officer and then left Kiva to join ProFounder Financial, a crowdfunding lending platform, as Chief Operating Officer. From 2006 to 2010, she ran a family foundation focused on providing technology solutions in the microfinance and education sectors. Prior to joining the administration of Phillips Brooks School, Olana was a management consultant through her company, Esan Partners, which provided strategic planning, executive coaching and leadership training. Olana has extensive board leadership experience and loves a good governance project. In addition to her role on our board, Olana is currently Chairperson of the Sama Group, Governance Chair of D-Rev, and a Board member of The Philanthropy Workshop (former Chair and Vice Chair). She graduated from the Honors Program of the University of Michigan, received her coaching certification from the University of California at Berkeley, and is a graduate of Stanford’s Graduate School of Business Executive Program. Betsy joined the Caminar board in 2014. She has over 30 years experience in marketing and management with a proven track record of developing disciplined approaches to marketing, strategy and company stewardship. She began her business career overseas with The Boston Consulting Group before joining Apple Computer, where she led marketing for the Apple’s K-12 Education business. Betsy then joined Paramount Communications as VP Marketing of their educational software division before becoming General Manager of Paramount Interactive, an internal technology start-up. She left here to join early internet start-up, OnLive Technologies, first as VP Marketing and subsequently as CEO. Since 2004, she has worked as a management consultant providing strategic market-driven advisory services to help companies and non-profits fuel their ideas with smart market decisions and successful business results. Betsy is an active, enthusiastic volunteer in the community and is a long-standing volunteer for Peninsula Family Service, where she previously served on the Board of Directors. Betsy received her BA from Brown University and her MBA from the Yale School of Management. Ted is the radio voice of the San Francisco 49ers, lead play-by-play voice for the Pac-12 Network and in his second decade as tennis and Olympics play-by-play announcer for NBC. He is a two-time Emmy Award winner. Ted has strong ties to Bay Area fans as he has worked as a radio and television announcer for the San Francisco Giants (nine seasons), as the television announcer for the Oakland Athletics (three seasons), as a television announcer for the Golden State Warriors and as the radio announcer for the Stanford Cardinal football program. In addition, he has a strong body of national work including 13 years with NBC covering Wimbledon, the French Open, and eight Olympics and world championships, which included assignments ranging from swimming to equestrian. Robinson also called U.S. Open tennis for 22 years on USA Network, as well as the NCAA basketball championship for five years on CBS. Ted grew up in Rockville Centre, New York, and attended Chaminade High School. He is a 1978 graduate of the University of Notre Dame, where he worked with future U.S. Senator Joe Donnelly and future Notre Dame Football coach Charlie Weis at the college radio station. Carole Middleton joined the board in November 2014. Involvement in community and charitable activities has been an important priority for Carole over the years. In addition to her work with Caminar, she is also on the Board of Trustees for Mills-Peninsula Hospital Foundation, US Olympic, and Ruskin Group Theatre in Santa Monica. She has been an active volunteer in programs for youth, health care, education, and African issues. Born in New York and raised in Connecticut, Carole received her B.A. from St. Francis College in New York before moving west. She received her Nurse Practitioner license from San Jose State University and worked for 20 years in Family Planning. She resides in San Francisco and has three beautiful children: Jennifer, Alex, and Tara. Tze was born in Malaysia and later educated in Singapore and Canada. After graduating from Ivey Business School, London, Ontario, Tze returned to Malaysia and started her career in property development corporations where she worked for a decade before returning to head the family property business. Her experience is in the fields of shopping malls, residential, commercial, and resort projects. Since moving to the Bay Area in 2010, Tze has been assisting her husband in his Defense Electronics Business. She has served on the Advisory Board at the Stanford Asian Liver Center since 2013. Sam is the Chief Operating Officer of the San Jose & Santa Cruz Service Area of Kaiser Permanente. Originally from Chicago, Sam has called the Bay Area home since 2012. Community development and giving back are lifelong passions. Over the years he has been a part of various community organizations that support youth, animal welfare, health care, and education, and he has supported them in a variety of roles. He has a Master of Science from Rush University and a Juris Doctor degree from DePaul University College of Law. Sam currently resides in San Mateo with his wife and Yorkshire terrier, Charlie Brown. Pratap earned his MBA from Penn State, and shares with the Board his 50+ years of IT Business experience. His career spanned from product management into the areas of marketing, engineering and quality assurance for research and development teams, until he retired from IBM in 2014. Pratap and his wife are proponents of access to quality education as a means to escape poverty, which led to his participation on the Citizens Oversight Committee for the San Jose Unified School District. They have two grown daughters involved in nonprofit work. One daughter works for Women’s World Banking in New York City and the other is a Behavioral Psychologist doing public policy research in San Francisco. They remain in their empty nest home in the Almaden Valley area of San Jose. Donna has provided nursing and case management services at many of our local medical centers, including Kaiser Redwood City, Sequoia Hospital, Mills-Peninsula Hospital, and San Mateo Medical Center's acute care hospital. While at San Mateo Medical Center, Donna was exposed to a wide variety of health care experiences, including floor nursing and clinic based services, work in the locked psych unit, discharge planning, and case management. Donna received her RN/ADN from the College of San Mateo. During the past few years, Donna has served on the Downtown San Mateo Association (DSMA) Board of Directors and provided care for elder family members. In her free time, Donna enjoys travel and horseback riding with her husband. Donna has resided in San Mateo County for over fifty years, where she and her husband raised their now two adult children. Donna wholeheartedly believes in the work of Caminar to educate the community and erase the stigma of mental illness. Born and raised in San Francisco, John started his culinary career in the city in the 1970s and 1980s. A graduate of the California Culinary Academy, he opened John Bentley’s in 1994. The restaurant became a treasured Peninsula dining destination. In spring 2018, John and his family accepted an offer to sell the property. In retirement, John has more time for his family and for community engagement, such as through service on the Caminar Board of Directors. Lisa worked at HP and Hewlett Packard Enterprise (HPE) for 15 years, primarily on the Social Innovation team. Her team won the Cause Marketing Forum’s HALO Gold Award for Best Service Campaign by garnering over 130,000 employees to participate in “Matter to a Million,” a partnership with Kiva. Most recently she managed the HPE Foundation, leading their community engagement programs and overseeing the company’s grant making. Lisa currently serves as an independent consultant working with corporations and non-profits. She also serves on the leadership team for The Changemaker Initiative, an Ashoka partner program, and is conducting a fellowship in social impact. Lisa is a member of Valle Monte League, an all-volunteer organization that has been supporting our FCS Division’s mental health programs since 1954, and serves on the Board of Directors of the Center for Excellence in Nonprofits (CEN). Lisa holds an MBA in International Management from the Thunderbird School, with a specialization in Global Finance, and a BA in political science from UCLA. understand that family and peer support are critical elements for a person struggling with mental illness. Kathy also has an extensive business background as an owner of a travel agency. Kathy was the Caminar’s FCS Division 14th Annual Circle of Support Luncheon Honoree in May 2017. Belinda Hanson has practiced family law for 22 years. Belinda is a Certified Family Law Specialist, and a Fellow of the American Academy of Matrimonial Lawyers. She has been recognized in "Best Lawyers in America" yearly since 2002, and in 2010 was named "San Francisco Area Family Lawyer of the Year" by Best Lawyers. In addition to being listed among Northern California's "Super Lawyers" by the Northern California Super Lawyers publication each year since 2004, she has also been included in the "Top 50 Northern California Female Super Lawyers" and the "Top 100 Northern California Lawyers." Belinda served on the board at the Thacher School in Ojai from 1994 to 2003 and most recently on the Peninsula Family Service Board in San Mateo from 2009 to 2012. Barbara, a long- time resident of Palo Alto, has been on FCS's Board of Directors since 2012 and is very active in FCS's annual fundraising event, the Circle of Support Luncheon as well as serving as a chair of the Board Development Committee. In recognition of her dedicated efforts, she was recognized as a Distinguished Volunteer Fundraiser by the Association of Fundraising Professionals (AFP) Silicon Valley at Philanthropy Day. A graduate of Georgetown University, she serves on multiple boards and just termed off Georgetown’s Board of Regents after serving for 6 years. She is a founding member of a new philanthropic model, the Maverick Collective, which is partnering with Population Services International (PSI), Melinda Gates, and the Crown Princess of Norway, in order to end extreme poverty by investing in girls and women. Barb believes in providing opportunities for women to succeed and in the ability of people to recover from addiction. She serves on the Executive Committee of Silicon Valley for Human Rights Watch (HRW), is a Trustee of the Nantucket Atheneum, and is a Past President of the Nantucket Garden Club. Barb has three grown children, now living on both coasts. Ken enjoyed a long career in sales and management at such institutions as Pfizer, Dean Witter, and Franklin Resources. In 1991, he established his own firm, Koskella Investments, from which he recently retired. Ken also has been active in local theater and comedy and in support of the recovery community. Linda was born in Belfast, Northern Ireland, and immigrated to the United States in 1960. Linda attended San Diego State University before moving to the San Francisco Bay Area, where she worked as a medical assistant and office manager. She and her husband, Richard, have been Hillsborough residents for over 30 years. Together they have five children and four “amazing” grandchildren. Linda enjoys traveling, reading, Pilates, and lots of family time. She was involved in her children’s schools and activities, as they were growing up. Later, she joined auxiliaries of several nonprofit organizations, such as Community Service League of San Mateo County and the Family Service Auxiliary. At Family Service, Linda served as President and helped launch a pilot mentoring program called Opening Doors. She also is a supporter of CASA’s services for at risk children, and CORA’s services for families involved in domestic abuse. Linda currently also serves on the executive board of Community Gatepath. Over the past few years she finds herself drawn to organizations involving mental health and disabilities. In Linda’s words: “In this incredibly advanced society of high tech, computers and cellphones, it is easy to feel disconnected and adrift.” She believes strongly in the mission of Caminar and the role it plays in providing much needed support for those living with mental health issues. Barbara is the Chief Operating Officer and cofounder of the Menkes Clinic and Surgery Center. The core of her forty-year career is in healthcare and management consulting. 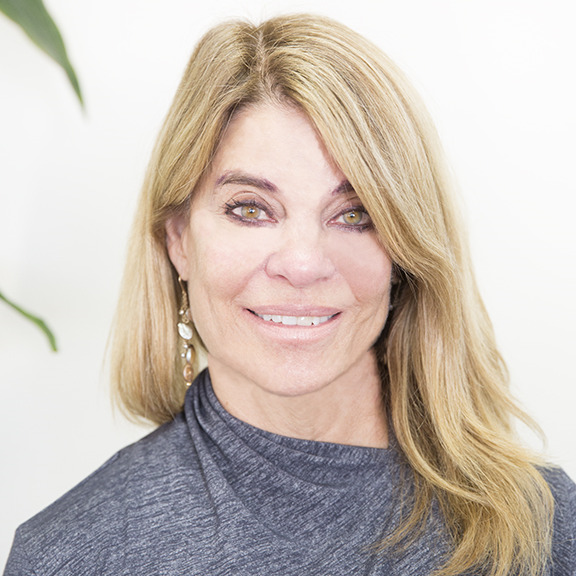 Barbara’s healthcare experience ranges from ICU bedside nursing to executive sales and operational management at Hill-Rom to founding and leading a Dermatology & Cosmetic Clinic. Her management consulting focus was aimed at accelerating performance in all aspects of sales, sales management, and communication processes for Grainger, Boston Scientific, and AAG -- all multi-billion dollar companies in a variety of industries. Relevant volunteer experience includes: Streetsmart4KIDS™’ Board President where she built the organization; Menlo High School’s Connections Beyond the Classroom chair and founder where she developed the infrastructure, formalized the mission and goals and managed growth and development of the team; as Board Member & Education Chair for Mills Peninsula Hospital Women’s Health Council created the bylaws, established committees and membership functions; and as Board Member and President of the Peninsula Temple Beth El’s Religious School Board restructured the Religious School Administration. Barbara graduated from Boston University with a Bachelor of Science in Nursing and lives in Hillsborough with her husband where they raised their two children. Rod is a founding principal and leads the Property and Casualty practice at ABD Insurance and Financial Services. He has 30 years in the commercial insurance industry, where he spent the first 10 years on the carrier side specializing in the design and management of large alternative risk workers’ compensation financial plans. In 1994, Rod joined the insurance broker community where he continued his focus on Workers Compensation but also quickly established himself as an expert on Property & Casualty, E&O/Cyber Liability, and Executive Liability, including IPO risks. Rod currently specializes in the risk management and strategic oversight for clients’ global insurance programs. He is a recognized as a leader and designer of innovative risk management plans for emerging and disruptive technology, life sciences, shared economy, and rapid growth clients. He is regularly invited to participate as a speaker at industry conferences and the development of new insurance products. Risk & Insurance Magazine recognized Rod as a "Top Power Broker." He earned his business degree from Cal Poly Pomona. Rod participates in many community activities, such as coaching youth sports and supporting local non-profit organizations. He lives in Atherton with his wife of 25 years, Jo-Ann, and their two daughters, Caitlin and Kelly. Frank Vento is a native of California’s San Mateo County and grew up on the San Francisco Peninsula. He worked in the family businesses which was a strong influence in shaping his work ethic and relationship building. He became a licensed Realtor in 2001, later receiving his broker’s license and certified CRS designation. Frank is active in real estate on the Coastside and Peninsula. Currently he manages Intero Half Moon Bay office. Elected by his peers to serve on the the Realtor San Mateo County Board of Directors (SAMCAR) for three years. After his tenure, he continues to volunteer on special events committee with SAMCAR. Having lived on the coast since the 1980’s, Frank was presented with many opportunities for community outreach work. As a member of the Community United Methodist Church in Half Moon Bay for over two decades, he has been active in helping with youth camp, outreach mission projects, and Pumpkin Festival food booth. He has been also been asked to serve on numerous service committees and currently is on the Board of Trustees. He currently serves as President of the Native Sons of the Golden West Parlor #230 in Pescadero, California. This organization is a plays a major role in helping preserve California history. Frank is a long time supporter of Caminar, having a brother-in-law who is a client fortunate enough to be the beneficiary of the many life-changing benefits Caminar's programs have to offer. Frank believes in giving back, and views board service as an opportunity to be an integral partner with the Caminar organization. A resident of Atherton, Barbara is a long-standing supporter of local mental health services. A former board member of Family & Children Services of Silicon Valley (now a division of Caminar), Barbara conceived of and helped to launch the organization's highly successful annual fundraising event, the Circle of Support Luncheon. A co-founder of the Tech Museum, Barbara and her husband, John (Glynn Capital Investments), raised four children on the Peninsula. Rich, who recently completed 24 years in elected office in 2016, including three terms representing the 21st and 24th Assembly Districts (San Francisco Peninsula/Silicon Valley), began his career in youth services, developing innovative programs to build protective factors against homelessness, delinquency, and other sources of psychological trauma for teens in high-risk environments. Mr. Gordon brought this depth of knowledge of issues affecting youth and families to the San Mateo County Board of Education, San Mateo County Board of Supervisors, and State Legislature. Due to term limits, Rich’s 24 years of continuous service in elected office ended in November, 2016. Over the years, Rich served on the Boards of Directors of several organizations, including the Redwood City Chamber of Commerce, Child Advocacy Council, and Rebuilding Together Peninsula, and on advisory committees of such organizations as the Junior League of Palo Alto-Mid Peninsula. Dennis, a Caminar Board member from 2009-2016, is President of Pantano Properties in San Mateo, holds a CA State Brokers License, and is a Certified Residential Specialist and a member of the Council of Real Estate Brokerage Managers. With 35 years of experience, he has been a Commissioner on the San Mateo County Assessment Appeal Board since 2004 and has served 9 years on the CA and San Mateo County Assoc. of Realtors Boards. Dennis, founder of “Books for Kids” program, helps fund books for local elementary schools. He received the “Golden Apple” award from the Redwood City/San Mateo County Chamber of Commerce, the San Mateo County Board of Supervisors Resolutions Award and State of CA Senate Award for his contribution to local educational systems. Ted is the Senior Vice President of Worldwide Sales at Quantum. His professional experience with a number of leading Silicon Valley technology companies is complemented by his commitment to community engagement with a focus on mental health and education. Ted has served as the Chair of the San Francisco Mental Health Board and as a Board Member of Community Vocational Enterprises in San Francisco. He holds an MBA from Stanford University, and a BA in Economics from the University of Notre Dame. He and his family reside in Menlo Park. Brenda has spent her professional and volunteer career focused on the issues of health, education, and public policy. She has previously worked for two members of the California legislature, most recently former State Senator Joe Simitian. Brenda previously was an executive with Planned Parenthood in Arizona and Chicago. Actively involved in the community, Brenda also serves on the boards of Los Altos Community Foundation and Santa Clara Family Health Plan and on numerous committees related to health and community well-being. Margaret Taylor is the retired Director of the San Mateo County Health Department. She founded both a local health plan and a children's health insurance program. She is a current member of the Board of Regents for Santa Clara University. She serves on the Boards of Sutter Mills-Peninsula Health Services/Palo Alto Medical Foundation and several non-profit organizations. Carol Whitfield has a proven and successful track record in the high technology industry, driving 2 IPO’s in the enterprise application software industry: Consilium (CSIM, acquired by Applied Materials) where she was a founder and Promis Systems (PRMS, acquired by Brooks Automation) where she was the Senior Vice President of Sales and Marketing. Carol began her career at Intel Corporation where she held a number of senior positions in planning and material management. Her experience includes executive positions in sales, marketing, corporate planning and field operations. Carol served on the board of Red Pepper Software that was acquired by PeopleSoft. Serving on the board of the Family Services Agency, Carol helped raise millions for their capital campaign. She has also served on the board of the Palo Alto Hills Country Club. Carol holds an undergraduate degree from Oxford University.